Prototype: German Railroad, Inc. (DB AG) ICE 4 high-speed train as the class 412/812. One (1) EW 1.2-H end car, class 812, 1st class. One (1) RW "Bordrestaurant" dining car, class 812, 1st class. One (1) TW 2.2 service car, class 412, 2nd class. One (1) MW 2-H intermediate car, class 812, 2nd class. One (1) EW 2.2-H end car, class 812, 2nd class. Powered Railcar Train 9005 as ICE 786, for the train route Munich Main Station – Würzburg Main Station – Fulda – Hamburg-Altona. The train looks as it currently does in 2018. Model: This is a 5-part version with a length scale of 1:95. The train has an mfx+ digital decoder and extensive sound and light functions. It also has controlled high-efficiency propulsion with a flywheel, centrally mounted in the "Bordrestaurantwagen" dining car. All 4 axles in both trucks powered by means of cardan shafts. Traction tires. The cabs in the end cars have interior details. The power pickup changes with the direction of travel and is always in the end car at the front of the train. The train has special close couplings with guide mechanisms. Triple headlights and dual red marker lights change over with the direction of travel, will work in conventional operation, and can be controlled digitally. The train has factory-installed interior lighting. The interior lighting is supplied with power from the continuous electrical connections for the entire train. Different color scenarios for the interior lighting can be controlled digitally. There is also cab lighting that can be controlled separately in digital operation. Maintenance-free warm white and different colored LEDs are used for all of the lighting. Both pantographs on the service car can be raised and lowered separately as a digital function. The minimum radius for operation is 437.5 mm / 17-1/4". Running the train on Radius 1 is also an option if you ignore the clearance gauge. Train length 151,5 cm. Different lighting scenarios for the interior lighting controlled digitally. Pantographs on the service car can be raised and lowered separately as a digital function. "World of Operation" mfx+ decoder with extensive light and sound functions. Five (5) piece basic train can be extended with the three (3) piece add-on set and an additional intermediate car. The five (5) piece 39714 basic train can be extended with the three (3) piece 43724 add-on set and the additional 43725 intermediate car. 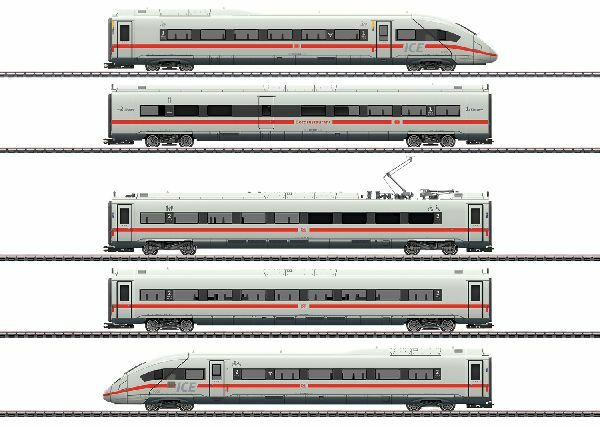 The basic train for the ICE 4 high-speed train can be found in a DC version in the Trix H0 assortment under item number 22971. The fourth ICE generation started at the end of 2016 with initially two twelve-part units in the testing and introduction phase. The ICE 4 (class 412) built by Siemens in cooperation with Bombardier is designed for use on lines with strong demand. In the future, it is supposed to replace urgently in succession the ICE 1 and ICE 2 and thus become the future backbone of the long-distance fleet. As a powered rail car train, the ICE 4 is set up for the greatest possible level of adaptability. An essential requirement for this are the so-called powered cars, where the main propulsion and current supply components such as transformers, traction current converters, traction cooling equipment, and the four traction motors are constructed identically and mounted beneath the car body. At present, the twelve-part trains being delivered consist of six "power cars", the dining car, the service car, two unpowered intermediate cars, and the two end control cars. The ICE 4 cars at 27.9 meters / 91 feet are somewhat longer than the previous ICE types at 26.4 meters / 86 feet. In conjunction with a new seating system, a larger seating capacity could be created while keeping the same legroom and creating more storage space for baggage. Despite its high seating capacity, the ICE 4 is comparably lighter, since both its modular features, the lighter trucks with inboard mounting, the powered trucks optimally designed for weight, and the further development of aerodynamic design provide savings in weight and energy. Compared to its predecessors, it needs up to 22% less energy. The non-powered trucks further developed from the Bombardier type FLEXX Eco with their low unsprung mass and very low weight contribute to a low energy consumption design and the option to apply streamlined skirting to them. By contrast, the sturdy powered trucks on the ICE 4 is a further development of the proven SF 500 family from Siemens and they fulfill the high requirements for bearing load and propulsion power. The electronic train control comes from SIBAS PN, the innovative railroad automation system from Siemens. This system hierarchically consists of the two levels ETB Train Bus (Ethernet Train Bus) with the various control components as well as the conventional train control (control lines, contactors, switches) and the train bus PROFINET, whereby everything is designed with redundancy. After several changes of contract, the DB ordered 1,511 ICE 4 cars, which were assembled into 50 twelve-part and 50 thirteen-part (seven power cars) as well as 37 seven-part (three power cars) trains. Two remaining end control cars are planned as reserve units. The ICE 4 trains are designed for a maximum speed of 250 km/h / 156 mph, but if needed they can have the motor gearing altered on the traction motors to 265 km/h / 166 mph. The twelve-part units are currently being delivered first. The first seven-part trains will then follow in succession. Delivery of the thirteen-part trains is supposed to begin in 2021, when delivery of the 50 twelve-part trains will have been completed.